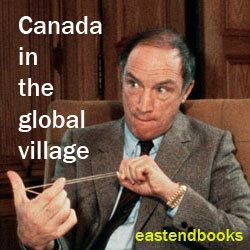 National holiday nostalgia .. should Canadian history just be forgotten in new global village? The kind of history that John Ibbitson apparently does think should be taught in Canadian civics classes is the somewhat more recent and much more right-wing British historian “Paul Johnson’s history curriculum” – “splendidly defended …. in his introduction to The Offshore Islanders, way back in 1972.” Yet in fact this is just the same kind of history that used to be taught in most English-speaking Canadian public schools – in the days before what Mr. Ibbitson calls the current “sort of rot that fills too many teachers’ heads” had a chance to develop. What both John Ibbitson and his June 30, 2007 Globe and Mail debating opponent, Mr. Michael Valpy, seem to agree on is that Canadian history is not seriously being taught in most Canadian tax-supported public schools nowadays anyway. And that is a shame. Because the real history of the most northern parts of North America over the past 500 years, say, is in fact quite interesting. And it ought to be informative and even useful for the diverse Canadian people of today, and for almost all the public policy issues they face in the early 21st century. Yet even for those few who do “take all your history credits” this is vague stuff at best. It does not do much to help you figure out what Canada is today and what its future might be – and how this relates to you, no matter what your own background may be in 2007. In fact, Canadian academic research over the past half century has produced a wealth of material that follows up provocatively on all the pioneering work in the first half of the 20th century. Some complain that “social history” has replaced “political history” in the stories of the past offered by the tax-supported public schools. It may be more apt to say that the new kind of Canadian political history towards which Innis and others pointed has yet to be written. Two rather clear hints about the kind of political (and social and economic) history that lies in wait for the Canada we increasingly seem to have today loom on the horizon. The first is that modern Canada is much or at least considerably older than the public school textbooks of the 1930s, 1940s, and 1950s proposed. And the second is that the history of the diverse (and even, as Stephen Harper puts it, eclectic) Canadian political nation rising around us now is still very new. “As Innis maintained,” R. Cole Harris told us in his preface to the 1987 first volume of the Historical Atlas, “the pattern of Canada has been taking shape for almost 500 years and by New World standards is old.” Put another way, the story of today’s rising Canadian multiculturalism has its deepest roots in the “Indian-European” fur trade of Canada that began in the 16th century – and had spread from the Atlantic to the Arctic to the Pacific oceans by the late 18th century. At the same time, the present confederation that began in 1867 – and whose 140th birthday was celebrated on July 1, 2007 – was not when it began the independent and almost grown-up Canadian political nation we have at last begun to know today. It was just the first self-governing dominion of the old British empire. The emerging free and democratic Canadian nation of today only began, in an altogether serious way, after the Second World War. There was no such thing as a Canadian citizen, for instance, until the first Canadian Citizenship Act was passed by the Parliament of Canada in 1947. (Before that inhabitants of the Canadian confederation were legally just known as British subjects.) Newfoundland and Labrador did not round out the emerging Canadian nation geographically until 1949. There was no Canadian flag until 1965. Until Pierre Trudeau’s Constitution Act 1982, many parts of the Constitution of Canada could still only be legally amended by the Parliament of the United Kingdom. Still more importantly, no doubt, the emerging Canadian political nation of the present day is still emerging. The Parliament of Canada only last year recognized that the Quebecois constitute a nation within a united Canada. There is still much work to be done on reforming the present Senate of Canada, to properly represent all Canadian regions equitably in the federal Parliament. We have only begun to realize what the original racial diversity and multiculturalism of the ancient fur trade era means for the long-term future in Marshall McLuhan’s global village. Though section 35 of the Constitution Act 1982 declares that the “existing aboriginal and treaty rights of the aboriginal peoples of Canada are hereby recognized and affirmed,” we are still far from any serious agreement on what this means practically. Much remains to be done, in other words, to bring the present-day emerging Canadian political nation into the full light of day. And it is going to be done by the remarkable assortment of people from virtually all parts of the global village who are assembling within Canada’s vast geography today. Our tax-supported public schools ought to be teaching the kind of Canadian history that can help this happen. The best thing about Canada Day, July 1, 2007, as you watched all the diverse young and old people alike, heading home from the fireworks by your local lake or river, was that it almost seemed certain this finally is going to happen, soon enough. There must be something a bit interesting about the history of the past 500 years that has brought all of us from all parts of the global village to this point in Canada today. Our tax-supported public schools, in all provinces (and territories) and both official languages, ought to be giving our diverse children a few broad hints about just what it is. Randall White is the author of a number of books on Canadian history and politics, including Ontario 16101985: A Political and Economic History, and (with the Toronto artist Michael J. Seward) On the Road in the GTA: An eclectic guide to the exurban sprawl of Greater Toronto.